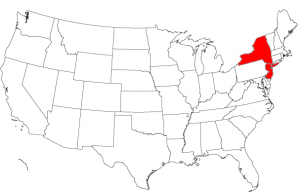 The Diocese of New York and New Jersey is a diocese of the OCA that existed from 1981-2005, was combined with the Diocese of Washington in 2005 to form the Diocese of Washington and New York and was re-established in 2009. 1.2 Eparhia ierarhului de drept? The first presence of Orthodoxy in New York City can is traced to 1870, when Father Nicholas Bjerring, a convert from Denmark, was directed by Metropolitan Isidore of St. Petersburg to open the first Orthodox Church in New York City. Services for the congregation were held in a chapel within Fr. Nicholas's house. In 1885 the Russian government withdrew its support of the mission due to the small membership. Orthodoxy in America recognizes as its beginning the arrival of Orthodox missionaries at Kodiak Island in 1794. The administrative center of the Mission in America, with the eventual sale of Alaska to the United States in 1867, gradually moved from Sitka to San Francisco in 1872. By the time that Bp. Tikhon arrived as administrator in 1898 and had made several extended pastoral journeys, it was obvious that the concentration of parishes and faithful was in the eastern United States. He recommended that the official name of the Mission be changed to the "Diocese of the Aleutians and North America" and suggested that the diocesan see be transferred to New York. This occurred in 1905. From that time until 1980 the parishes in the New York-New Jersey geographic area were officially under the auspices of the ruling hierarch of what is now the Orthodox Church in America (OCA). The initial establishment of parishes in the Diocese closely paralleled the immigration patterns of the immigrants who came before and after the First World War and in connection with the consequences of the Bolshevik Revolution. Approximately half of the present 50 parishes began during this period (1894-1930). The energetic ministry of Fr Alexander Hotovitzky (1895-1914) should be recognized as a significant feature of these early years. Fr. Alexander, as Dean of the St. Nicholas Cathedral in New York, was instrumental in the formation of several Diocesan parishes (as well as some outside of the Diocese). The Russian Orthodox Church, in recently glorifying Fr. Alexander and Fr. John Kochuiov, emphasizes their deaths as martyrs that took place after their return to Russia. But for the OCA, their significance as Orthodox missionaries in America was affirmed in the words of Metropolitan Theophilus: "The American Orthodox Russian people stand on four corners - Bishop Nicholas, Fathers Hotovitzky, Kochurov, and Nedzelnitsky." A later period (from 1958 to 1981) might be called the "time of mission". This is characterized by parishes located in suburban areas (rather than the industrial centers of the first period), by the often pan-Orthodox or pan-ethnic make up of the congregations, and by the resulting use of English as the primary liturgical language. Here, the pastoral work of Fr. John Nehrebecki, Dean of the New Jersey Deanery for over thirty years, should be mentioned. Under his guidance the other 10 churches were founded. Protopresbyter Alexander Warnecke, chancellor emeritus. Ultima editare a paginii a fost efectuată la 6 decembrie 2018, ora 21:00. Pagina a fost accesată de 254 de ori.